The responsibility for provision of closed circuit television systems in town centres has long been a grey area, and Dorset’s Police and Crime Commissioner Martyn Underhill has visited Tolvaddon in Cornwall to see how a new integrated approach to CCTV is being taken. 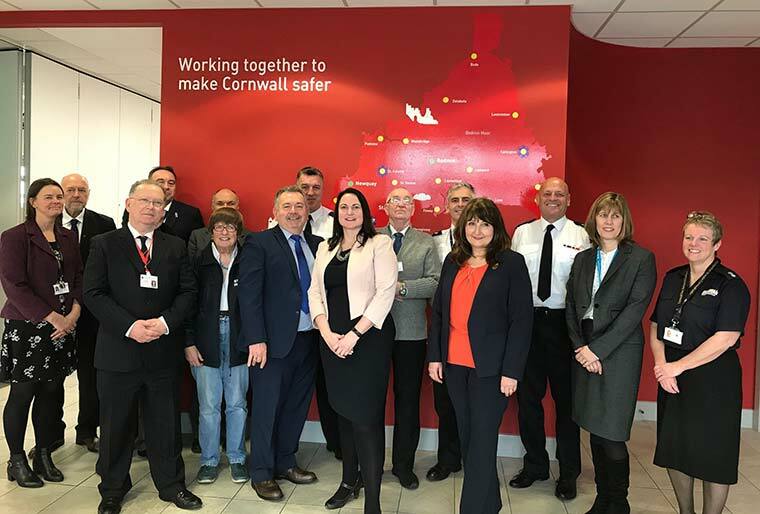 Across the county of Cornwall, an alliance between local towns, the fire service, Cornwall Council and the office of the Devon & Cornwall Police and Crime Commissioner is finding solutions. Martyn Underhill said, “One of the main reasons I have come here is because of the fire involvement in this project. “Dorset is quite similar to Cornwall in its make-up and I see a synergy between both. We do have a CCTV project in Dorset but fire are not involved and as PCC I want to try and bring the whole of Dorset into one CCTV system. The PCC for Devon & Cornwall, Alison Hernandez said, “Safe, resilient and connected communities are the focus of the Police and Crime Plan and CCTV in our communities plays a fundamental part of that journey.